This post is based on Zecharia Sitchin text and his theory about Tiamat and Earth; “Our Moon, we suggest, is Kingu, Tiamat’s former satellite”. The Collision of Tiamat: Earth Ancient Sumerian texts indicate that the Earth (“Tiamat”) was struck by a large planet, which moved it into its present orbit, and created the Moon and the Asteroid Belt. In his books, The Twelfth Planet and The Cosmic Code, Zccharia Sitchin outlines this “celestial battle’ as described in the Babylonian text called Enuma dish. The planet “Marduk” (the Sumerian “Nibiru”), as it came into the solar system on its clockwise elliptical course, struck Tiamat, which was moving in its ordained counterclockwise orbit. One of Marduk’s satellites struck Tiamat first, followed by two more of Marduk’s moons. Then Marduk itself, an enormous planetary body, struck Tiamat, smashing one half of the planet into pieces, which became the Earth’s Moon and the “Great Band” (Asteroid Belt). The other half of the planet, which was struck by a smaller moon of Marduk, was moved into a new orbit, along with a chunk of material which became its moon. The new planet was then called “KI,” meaning “cleaved one.” The Earth’s original moons were dispersed, many changing the direction of their orbits. (3) it was originally part of the Earth and was torn off, leaving the Pacific Ocean bed. Velikovsky suggested that the first and third theories are incorrect, since “in the memory of mankind, no Moon accompanied the Earth.” He found it more probable that the Moon’s formation occurred somewhere else, and that it was captured in Earth orbit following some type of catastrophe. 1879 by George Darwin, son of biologist Charles Darwin, is that the Moon may once have been part of a larger, molten -proto-Earth” planet that was spinning so fast it shed big blobs of material into orbit, forming the Moon. Another theory held that the Moon may be a “sister planet,” formed in the same way as the Earth (but happening to be in Earth’s orbit) through the accretion (slow growth) of dust and smaller planetesimals (small solid celestial bodies that may have existed early in the development of the solar system). The third classical theory for the origin of the Moon is that it formed elsewhere in the solar system (through slow accretion) but wandered too close to Earth and was captured by our planet’s gravity and pulled into Earth’s orbit. Ancient records says the moon came into orbit around Earth between 11.500-13.000 years ago. The Earth is estimated to be 4.6 billion years old, yet some moon rocks were dated to be 5.3 billion years old. The moon dust that is spread throughout the surface of the moon is estimated to be even older at 6 billion years. Also the rocks and the dust are both different in composition, meaning the dust didn’t come from the decay of the rocks, but from somewhere else. It seems strange that the moon is just the right distance, tied with the exact diameter, to completely cover the sun during an eclipse? “There is no astronomical reason why the moon and dun fit so well. It is the sheerest coincidences, only th Earth among all planets is blessed in this fashion”. It is more than feasible that the reason the moon never shows one side to Earth is because there is an alien presence on it or within it, keeping widely used areas hidden. As outrageous as the moon is a alien ship theory is, all of the evidence points to the clear fact that the moon is indeed hollow and being used by aliens and was brought here eons ago by an intelligent species. Could Earth´s moon be part of The Nibiru Solar System and when it´s passing Earth around 12.700 years ago Earth´s gravity pulled into Earth´s orbit, or is the Moon a sister planet and a “proto-Earth planet” since the moon is 5.3 billions years old and Earth is 4.6 billions year old? If the moon was pulled into Earth´s orbit from the Nibiry Solars System when it passing – could this moon been habited with the Annuaki, and if so, could the moon therefore today be a base for these Annuaki at the backside of the moon? Zecharia Sitchin says; “Our Moon, we suggest, is Kingu, Tiamat’s former satellite”. 4.6 billion years ago, when Tiamat—the proto-Earth–orbited Solaris beyond Mars, Tiamat’s moon, Kingu, almost attained solar orbit. But 600 million years later, Nibiru entered the inner Solar System. Nibiru’s moon, Evil Wind, hit Tiamat into orbit within Mars’and left Kingu circling Earth. Our Pioneer and Voyager probes sent back evidence Kingu formed from Tiamat, the planet that became Earth. Tiamat, then beyond Mars, generated Kingu. The collision depleted most of Kingu’s iron, “resulting in decrease in its density. The mass of the Moon’s core “bears the mark of the ‘big whack’ compressed the moon, just as the Sumerians related. Contrary to views the moon was always inert, it was found in the 1970s and 1980s to possess all attributes of a planet except independent orbit around the Sun: rugged mountains, plains and seas formed by water [or] molten lava. It retained a magnetic field caused by rotation of a molton iron core, heat and water, astrue of Earth and other planets” until the Evil Wind struck it. 3. The Earth’s original moons were dispersed, Around 12.000-13.000 years ago ancient records tells us there was no moon at this time and this was when the Flood of Noah occured and One of Nibiru´s Moon may be pulled into Earth´s orbit when it passing Earth. 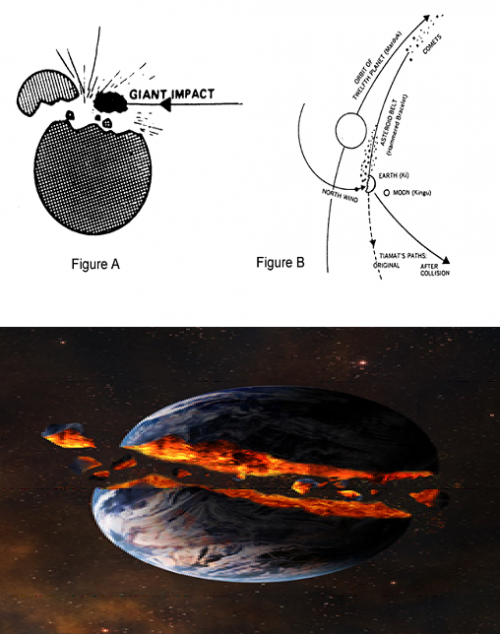 If Tiamat (Earth) and Nibiru´s Moon Kingu collided and split Earth in two pieces, what happened with the Moon (could even the Moon have been split and can that be a reason why we just the front of the moon and not the backside of Moon.